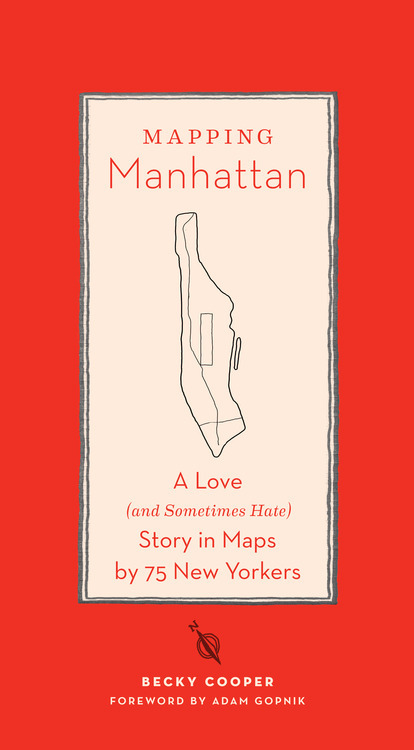 Mapping Manhattan: A Love (And Sometimes Hate) Story in Maps by 75 New Yorkers is a new book of hand drawn maps of Manhattan by ordinary and extraordinary New Yorkers. The book is part of Map Your Memories, a participatory art project by Becky Cooper. We previously wrote about the project back in February. Armed with hundreds of blank maps she had painstakingly printed by hand, Becky Cooper walked Manhattan from end to end. Along her journey she met police officers, homeless people, fashion models, and senior citizens who had lived in Manhattan all their lives. She asked the strangers to “map their Manhattan” and to mail the personalized maps back to her. Soon, her P.O. box was filled with a cartography of intimate narratives: past loves, lost homes, childhood memories, comical moments, and surprising confessions. A beautifully illustrated, PostSecret-style tribute to New York, Mapping Manhattan includes 75 maps from both anonymous mapmakers and notable New Yorkers, including Man on Wire aerialist Philippe Petit, New York Times wine critic Eric Asimov, Tony award-winning actor Harvey Fierstein, and many more.